Trees are the answer to many of the issues we face in an urban environment. Yet, there comes a time when it is appropriate to remove a tree. Removing trees, even small ones, is very dangerous work. Therefore, it is important, and required by law, to hire an expert. Why is it important to hire an expert just to remove a tree? A licensed tree expert is required to have training and follow safety procedures. Further, in the event that something does go wrong, a licensed tree expert is required to be appropriately insured and bonded. 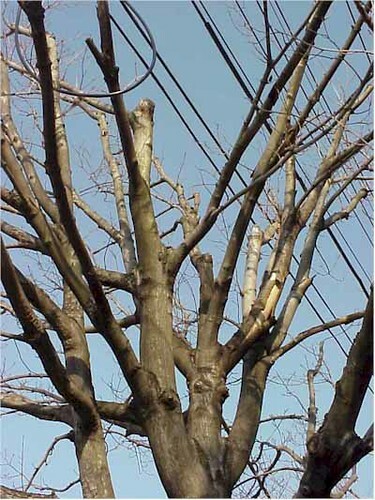 Maryland offers tips (PDF, 27KB) on how to hire someone to remove, or trim, your trees. Is the tree in the right-of-way of any roads? If yes, contact the Maryland Department of Natural Resources Forest Service to obtain a “ Roadside Tree Project Permit” (PDF). A permit is required from Maryland for planting, pruning, or removing a tree from ANY right-of-way. This includes streets and roads maintained by villages, towns, cities, the County, and the State. Is the tree in the right-of-way of any road maintained by Montgomery County? If yes, contact the Montgomery County Department of Permitting Services (DPS) to obtain a permit . Anyone who applies for a building permit, a sediment control permit, or a permit to work in a right-of-way maintained by Montgomery County is required to comply with the Roadside Tree Law. Are you disturbing more than 5,000 square feet of canopy or soil? If yes, contact DPS for a sediment control permit. Check with DPS about other requirements for obtaining a sediment control permit, including building a home or buisness. What about the Canopy Conservation Law in Montgomery County? Anyone who is required to obtain a sediment control permit from Montgomery County is required to comply with the Tree Canopy Law . Is the tree in a conservation easement? If the tree is in a conservation easement , then contact your Planning Team within the Montgomery Planning Department for permission to remove the trees. Is the tree on a historic site? If the tree is in an historic area designated by the Montgomery Planning Department, then contact them to determine if a Historic Area Work Permit is required to remove the tree. Are you in an incorporated city, town, or village? If yes, contact your city, town, or village officials directly before performing any tree work. Within Montgomery County, there are many incorporated cities, towns, and villages. Each of these may have their own codes and regulations regarding street trees and trees on private property. Do you live in a homeowner’s association or civic association with rules or guidelines? If yes, check with your home owner’s association or civic association directly. In all cases, if a tree is found to be hazardous by a Maryland licensed tree expert (LTE) or certified arborist, the hazard may be removed as soon as possible by an LTE. The LTE must notify, in writing, the appropriate agency within 14 days. Any work beyond what is needed to remove the hazardous condition must be completed with necessary permits. For example, a hazardous branch on a tree may be removed by an LTE without prior permission but all non-hazardous sections of the tree must remain until required permits are obtained. Why is it important to hire an expert to work on your tree? In Maryland, anyone being paid to work on trees is required by law to be Licensed Tree Expert. To verify a license, call the Maryland Forest Service or call 410-260-8531. A licensed tree expert is required to be well-trained and experienced in how to care for trees, how to trim or remove trees, how to recognize hazardous trees, how to plant trees… all in such a way as to be safe and follow laws. Further, a Maryland Licensed Tree Expert is required to be appropriately insured and bonded. Maryland offers tips (PDF, 27KB) on how to hire someone to remove, trim, or plant your trees. Ask to see their Tree Expert license. Any Licensed Tree Expert will carry a card that contains their three digit expert number and verifies their status as being licensed. To verify it, contact the Maryland Forest Service or call 410-260-8531. Ask for proof of insurance. A Licensed Tree Expert will have insurance coverage for personal and property damage, as well as worker’s compensation insurance. Ask for references. Find out where the company or person has done work similar to the work you are requesting. Don’t hesitate to check references or visit other sites where the company or individual has done tree work. Get an estimate in writing. Licensed Tree Experts are required to enter into a written contract with each client. Be sure to read the contract carefully and make sure it includes information on when the work will be started and completed, who is responsible for clean-up, and the total price and an hourly rate if more work needs to be done. Be wary of individuals who solicit business door-to-door. While these individuals may appear to be offering lower costs for tree care services, be assured it’s no bargain. A person soliciting business door-to door will often give a cell phone number and no other means of contact (this makes it very difficult to find them should a problem arise). All Licensed Tree Experts must maintain up-to-date contact information with the State. Are there Other Certifications for Tree Experts? If your neighbor’s trees are bothering you, there may be something you can do. Here are some answers to frequently asked questions about trees and neighbors. The information below is adapted from Maryland Forest Service’s fact sheet " Fallen Trees on Private Property” (PDF, 89KB) . Can You Remove Branches from Your Neighbor’s Tree? Maryland has adopted the “Massachusetts Self-Help Rule” that says you must assume responsibility for the care and preservation of your own property. This means that you can cut branches that hang over onto your property. However, you may not destroy the tree in the process, nor can you cut the tree down. Also, you must stop at the property line unless the neighbor has given you permission (it’s best to have it in writing). Any person who trespasses and removes trees or branches without an owner’s permission, unless they work for a public service company or a public roads agency, may be liable for any surveys or appraisals needed, court costs that may incur, and triple the amount of the value of the trees or timber cut. A Tree Fell onto My Property – Who is Responsible? In Montgomery County, and all of Maryland, when a tree or its branches fall it is considered an “Act of God”. This means the portion of the tree and the damage from it that is on your property is your responsibility to clean up and repair. The portion of the tree and damage on neighboring properties is their responsibility. Such accidents are normally covered by the affected owner’s insurance, and are usually resolved by reporting a claim. An exception to this general rule is that the owner of the property where the tree originated may be responsible for damage to a neighbor’s property if the owner knew, or had good reason to know, that the tree presented a danger to adjoining properties. For example, if a tree was diseased and had been weakened by storms, it may be fair to say that the owner had reason to believe that the tree would fall and, judging by its size and location, damage a neighbor’s property. Otherwise, if a hazardous condition is not known, the accident is considered an “Act of God” and the affected property owner is therefore responsible for the damage their property. Is Your Neighbor’s Tree Hazardous? If you feel that your neighbor has a tree that is hazardous to your property, you should try to resolve your concerns with your neighbor. If you are unable to do so, the Montgomery County Department of Housing and Community Affairs may be able to help you. To file a complaint, call 3-1-1 or go online . The emerald ash borer (EAB) is an exotic pest from Asia that infests and kills ash trees. Ash trees are a valuable resource that provides wood for baseball bats, cabinets, hardwood flooring, and many other commodities. Learn more about Emerald Ash Borer and how to protect your ash trees on our blog. There are many insects and diseases of forests and trees in Montgomery County. Most are well integrated in the environment and don’t pose a threat. The gypsy moth is one that Montgomery County monitors and treats when necessary. The gypsy moth is a very destructive invasive species to forests and urban trees in Maryland and much of the eastern United States. Gypsy moth caterpillars eat the leaves of trees, especially oaks, and other plants. When populations of caterpillars are high enough, they can eat most of the leaves off trees. This weakens trees and makes them more vulnerable to other pests, diseases, and infection. In many cases, repeated damage by gypsy moths can kill trees. The Maryland Department of Agriculture Gypsy Moth Program has more information. Call them at 410-841-5922 for more information, or to report a defoliation. These two caterpillars are often confused. This fact sheet explains the differences between gypsy moths and eastern tent caterpillars. ( PDF, 27K) Eastern tent caterpillars are native and are not a serious threat like gypsy moths. The eastern tent caterpillar builds a web-like tent in the spring while gypsy moth caterpillars do not build any type of tent. The tents of eastern tent caterpillars are unsightly but rarely cause damage to trees. The Maryland Department of Agriculture (MDA) recommends tearing apart the tents with a stick or a pole. This allows birds to feed on the caterpillars. Read MDA's overview of eastern tent caterpillars including more information about how to control them. Are you seeing web-like tents in the fall? It could be the native fall web worm. Like eastern tent caterpillars, their tents are ugly but the insect is generally harmless. In the fall and winter, look for gypsy moth egg masses in the crevices of tree trunks, fencing, and woodpiles. Remove the egg masses by scraping them into a zip-top plastic bag containing some water and detergent to kill the eggs. Then put the bag in the trash. Be careful when removing egg masses because the hairs on the mass can cause topical allergic reactions.